Based on the novel by Michael Lewis, The Big Short is about the financial crisis in 2007 and 2008 and how a small number of individuals knew it was coming and tried to salvage what they would be lost. Directed by Adam McKay and screenplay by McKay and Charles Randolph, the film is an unconventional take on the crisis with its mixture of humor, drama, and moments that break down the fourth wall. Starring Christian Bale, Ryan Gosling, Steve Carell, Marisa Tomei, Rafe Spall, Finn Wittrock, Hamish Linklater, Jeremy Strong, Melissa Leo, and Brad Pitt. The Big Short is a gripping and chilling film from Adam McKay. Set in the mid-2000s just a few years before the world economy would collapse in such a massive way, the film follows the lives of a few different men who would make a discovery that would lead to its collapse. Told through three different narratives, the film follow the events of these men who wouldn’t just discover loans and bonds that would cause the housing market to become unstable but also do whatever they can to survive and profit from this upcoming financial collapse. The film’s screenplay by Adam McKay and Charles Randolph weaves through these multiple narratives as the storyline of the different individuals who would be part of this catastrophic event would all effect one’s narrative and such. Even as there’s moments where a character from one storyline is in the same place with other characters from that storyline but none of them really meet each other. The character Dr. Michael Burry (Christian Bale) is this oddball hedge fund manager who is socially-inept as he would start the whole story going when he would look into numbers involving high-risk subprime loans as he decides to make a bet against market-based mortgage-based securities by using a credit default swap. Dr. Burry’s plans had bankers laughing thinking he would fail as his actions wouldn’t just get the unwanted attention of his mentor Lawrence Fields (Tracy Letts) but also the attention of a low-level salesman for Deutsche Banks in Jared Vennett (Ryan Gosling) who is the film’s narrator. He would learn about what Dr. Burry is planning where he joins forces with Front Point hedge fund manager Mark Baum (Steve Carell) after one of Baum’s employees called Vennett by accident as the two analyze what Dr. Burry has found. From a prospectus that Vennett created, two young investors in Charlie Geller (John Magaro) and Jamie Shipley (Finn Wittrock) would find that prospectus as they would take part in the plan to buy credit default swaps with the advice of a former securities trader in Ben Rickert (Brad Pitt). The film’s narrative would cross-cut through all three different storylines as well as explore all of the traits of these characters as Vennett is a man that is vain and interested in getting the money from the fallout that is to come while Baum is a man just trying to make sense of the world he’s working for as he’s also dealing with his brother’s suicide. The duo of Geller and Shipley are just two guys that wanted to be rich as they get the help of Rickert as they would make a move that would be big but there comes a moral price over what had happened as it would be a discovery that would make Baum not just uneasy but also realizing the large scale of what is to come. Each act opens with a quote as it play into these men making a discovery and see what would happen and then realize the massive scale of the risk as almost everyone in the financial world is against them. Yet, it’s a risk that is would showcase not just the sense of arrogance and indifference of these people in finance but also those who would be seriously affected by this crash. McKay’s direction is definitely quite engaging for the way it explores the world of finance in all of its complexities and finding a way to make it accessible for anyone who has no clue about bonds, stocks, securities, or anything in the world of finance. Shot largely in New Orleans with some of it shot on other locations such as New York City and Las Vegas. McKay would create something that is grand in some scenes but maintain some intimacy in his usage of close-ups and medium shots as it relates to the drama. Especially in the usage of hand-held camera for these scenes while giving each storyline a different tone as the Dr. Burry storyline is often set in an office building while the stories involving Venette/Baum and the trio of Geller, Shipley, and Rickert also have different presentations though there is that one scene where the two groups are in the same sequence through an intricate tracking shot. Since the idea of finances and all of the things that go on are considered very complex to anyone that has no idea about these things. McKay would use a few celebrities like actress Margot Robbie, singer/actress Selena Gomez, famed chef Anthony Bourdain, and the economist Richard Thaler to provide some comical expositions to reveal what is a mortgage-based security, a subprime loan, a collateralized debt obligation, and a synthetic CDO. McKay would also showcase images and footage of what was the culture of the world was like in the mid-2000s as people are unaware of what is happening as its third act is quite dark. Notably in the sense of immorality that is happening in the financial world and the people who really lose it all which makes characters like Baum and Rickert uneasy. Especially as it once again play into this air of cynicism and what often happens in the financial world on who is saved and who is left in the dust. Overall, McKay creates a haunting yet evocative film about a group of individuals who would make a discovery that would shake up the financial world in the late 2000s. Cinematographer Barry Ackroyd does excellent work with the film’s cinematography from the usage of natural and low-key lights for the scenes at Dr. Burry’s office as well as the lighter look of the scenes at Baum’s office as well as some of the stylish yet low-key lights for some of the scenes in Las Vegas. Editor Hank Corwin does brilliant work with the editing with its usage of jump-cuts, freeze-frames and other stylish cuts to help find ways to create smooth transitions for the different storylines as well as using montages to play into the growing sense of time. Production designer Clayton Hartley, with set decorator Linda Lee Sutton and art director Elliott Glick, does fantastic work with the look of the different offices as well as the garage office that Geller and Shipley work at and the home of Rickert. Costume designer Susan Matheson does nice work with the costumes as it’s mostly casual with the suits that the men wear as well as shorts and t-shirt look of Dr. Burry. Visual effects supervisor Paul Linden does terrific work with some of the film’s visual effects which is essentially set-dressing to play into the period of the mid-2000s. Sound editor Becky Sullivan does superb work with the sound as it play into the world of parties and meetings where it can be raucous but also quiet. The film’s music by Nicholas Britell is wonderful for its low-key electronic score that play into the drama while the soundtrack features an array of music from rock, hip-hop, and pop music. The casting by Kathy Driscoll and Francine Maisler is incredible as it feature some notable small roles and appearances from Rudy Eisenzopf as the mortgage-backed security creator Lewis Ranieri, Max Greenfield and Billy Magnussen as two young mortgage brokers who con people into getting bad loans, Byron Mann as a CDO manager Baum talks to in Vegas about synthetic CDOs, Karen Gillian as the ex-girlfriend of Shipley’s brother who meets Shipley in Vegas who dismisses him as she had just quit the SEC, Adepero Oduye as Baum’s colleague Kathy Tao, Tracy Letts as Dr. Burry’s mentor Lawrence Fields who is aghast over what Dr. Burry did, Melissa Leo as a Standard & Poor’s employee who make some revelations to Baum about some of the dark aspects of the financial industry, and Marisa Tomei in a terrific small role as Baum’s wife Cynthia who is trying to help him with his own revelations as well as the loss of his brother. John Magaro and Finn Wittrock are superb in their respective roles as Charlie Geller and Jamie Shipley as two young investors who discover Vennett’s prospectus as they try to take advantage of their discovery in the hopes they would get a chance to be part of the elite in finance. The trio of Rafe Spall, Jeremy Strong, and Hamish Linklater in their respective roles as Baum’s three employees in the optimist Danny Moses, the rash and impulsive Vinny Daniel, and the reserved Porter Collins as three men who help Baum in figuring out numbers as well as discovering how much would be lost. Brad Pitt is excellent as Ben Rickert as a retired securities trader who helps Geller and Shipley with their discovery as it’s a very low-key yet humorous role as a man who reluctantly returns to the world of finance but what he discovers would make him uneasy. Christian Bale is brilliant as Dr. Michael Burry as a hedge fund manager who would discover the instability of mortgage loans as this oddball that loves to listen to heavy metal as a man who is great with numbers but awkward when it comes to people as he tries to profit everything and ensure the trust of his investors. Ryan Gosling is amazing as Jared Vennette as a low-level salesman for a powerful bank who would discover Dr. Burry’s report and take advantage of his discovery while teaming with Baum to make some money as Gosling’s performance is funny in display his air of arrogance. Finally, there’s Steve Carell in a marvelous performance as Mark Baum as a hedge fund manager for a financial company who would team up with Vennette in betting against the market as he would make a startling discovery of what is going to happen that consumes him with guilt as Carell has this air of energy and anger in his performance that is coupled with humility and sadness. 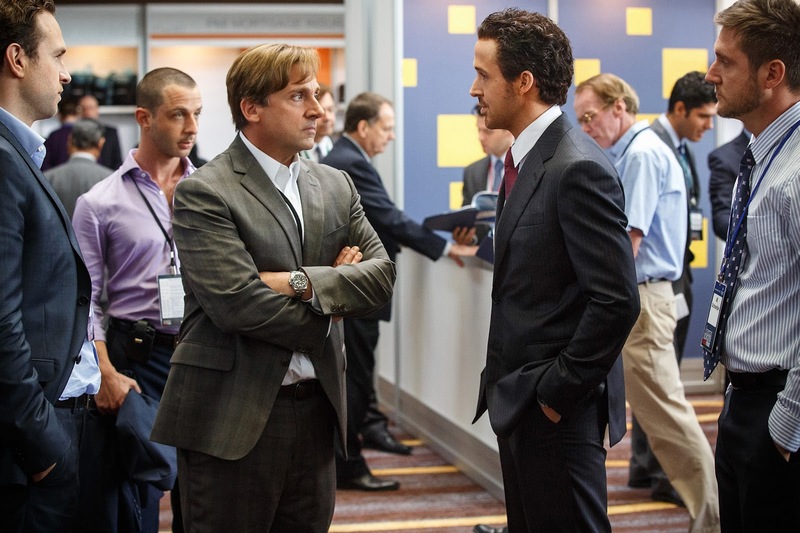 The Big Short is a spectacular film from Adam McKay. Featuring an inventive script, an incredible ensemble cast, and witty views of financing with stylish moments of exposition that prove to be helpful. It’s a film that explores a moment in time where the world’s finance industry was hit by their own stupidity and those who saw it coming and tried to warn them. 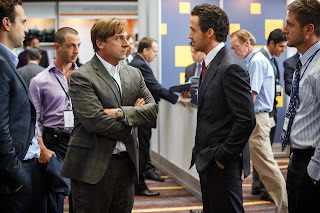 In the end, The Big Short is a phenomenal film from Adam McKay. I'm totally with you that this film is both gripping and chilling. The magic of it is that they did it despite having a subject matter seemingly more fit for a powerpoint presentation than a feature film. The writing is strong and that cast is phenomenal (I named it The Best Ensemble of 2015). So glad you enjoyed this one. I agree with you on all fronts here. I loved this movie. Named it my favorite of 2015. So much greatness, especially in McKay's direction. He really cuts through all the confusion of the subject matter and gets you there. I'm glad you watched both this and 99 Homes. Both excellent movies. @Wendell-It was a bit hard to follow early on but this is why those celebrity cameos were helpful as it showcased everything you needed to know. Plus, that is one hell of an ensemble as I think Adam McKay does some of his best work in that film. @Kevin-A lesser director or someone with a certain pedigree and an angle would've made the film very complicated yet McKay was able to do something that was engaging but also not be afraid in being cynical yet truthful. @Brittani-Same here. We need these films in this age of Il Duce. Great review! I saw this one for the cast but I was worried I wouldn't be able to keep up with the plot. Thankfully all those cameos really helped and whilst I probably couldn't teach anyone about the financial housing sector now...I felt like an expert at the time! @Allie Adkins-Thank you. I too was worried that a film about finance was going to be hard to follow but those cameos and such really helped. @Roman J. Martel-That film did make me angry over the fact that here in a country that is supposed to be for the people and by the people has become more about for the rich and powerful while we the people are fucked over. It's the film we the world need right now in this age of Il Duce.